A coat of arms to honour murdered MP Jo Cox has been unveiled in Parliament by her two children. The memorial plaque featuring a coat of arms designed by Cuillin, six, and Lejla, four, was installed in the Commons chamber. 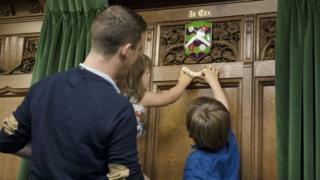 It was part of a "family day" as MPs and staff were encouraged to bring their children into the chamber. Mrs Cox, 41, was shot and stabbed in Birstall, West Yorkshire, part of her Batley and Spen constituency. The crime happened little over a year ago, on 16 June 2016. The design of the plaque was inspired by Mrs Cox's maiden speech. It contained the line, "we are far more united and have far more in common than that which divides us". The four roses represent her family members - two red for the Labour Party and two white for the county of Yorkshire. MPs killed while in office are remembered by heraldic shields in the Commons. They Include Conservative MP Ian Gow, killed by an IRA car bomb in 1990; and Tory shadow Northern Ireland secretary Airey Neave, who died in a car bomb attack in Westminster in 1979.